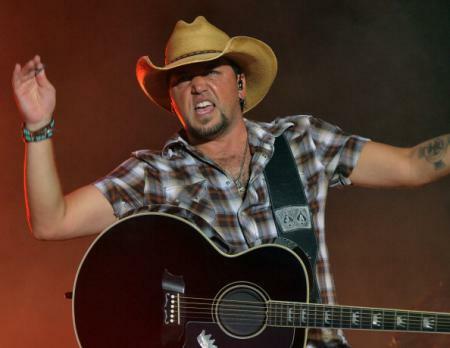 Jason Aldean Net Worth 2018: Hidden Facts You Need To Know! 1 Engaged to Brittany Kerr [September 24, 2014]. 2 His father wrote chords on a piece of paper, to teach him to play the guitar. 3 Grew up on Hartley Bridge Road. 4 Spent summers in Homestead, Florida with his dad. 5 His hometown is Macon, Georgia. 6 Moved to Nashville, Tennessee on November 1, 1998, when he was 21. 7 Has one sister, and two step-brothers. 8 At 15, he joined the house band at the Macon nightspot Nashville South. A year later, he bought his first vehicle with money he'd earned singing, a 1985 Toyota pickup with a rusted-out tailgate. 9 Started singing when he was 14, after being inspired by Country Music Awards (CMA) on TV. 10 Had his first child when he was 27. 11 Married his high school sweetheart when he was 24. 12 Children: Keeley Williams (b. February 14, 2003) and Kendyl Williams (b. August 20, 2007 at 6 lbs. 11 oz.). 1 [angry at criticism of fellow songwriter Luke Bryan] I've never been accused of being politically correct. You don't have to do that, though. I know there are people who don't like what I do, and that's fine. There are people out there doing stuff I don't necessarily like. If we all did the same thing it would be boring. Doesn't mean you have to rip people apart, though. 2 Many of those old songs were written during the Great Depression. I didn't live through the Depression and neither have many of the songwriters, so of course the subject matter has to change. It evolves. You can't write the same subject matter for fifty years. Look at what hip hop used to be compared to where it is now. Or rock music, for that matter. People making a big deal of it doesn't make any sense to me. 3 I love rock, I love John Mellencamp, 1980s rock and Bob Seger. But, if anyone wants to do a pop quiz on old country, I'll take 'em on. Just because it's not what I play as my version of country doesn't mean anyone has a right to judge what I do. It's a ridiculous debate. 2014 Grammy Grammy Awards Best Country Album For the album "Night Train." 2012 Grammy Grammy Awards Best Country Solo Performance For the song "Dirt Road Anthem." 2012 Grammy Grammy Awards Best Country Album For the album "My Kinda Party." Patriots Day 2016 performer: "Dirt Road Anthem"
Madden NFL 17 2016 Video Game performer: "Lights Come On"
IHeartRadio Music Awards 2015 TV Special performer: "Burnin' It Down"
The Heart of Country: How Nashville Became Music City USA 2014 TV Movie documentary performer: "Crazy Town"
The 54th Annual Grammy Awards 2012 TV Special performer: "Don't You Wanna Stay"
41st Annual Country Music Association Awards 2007 TV Special performer: "Johnny Cash"
40th Annual Country Music Association Awards 2006 TV Special performer: "Hicktown"